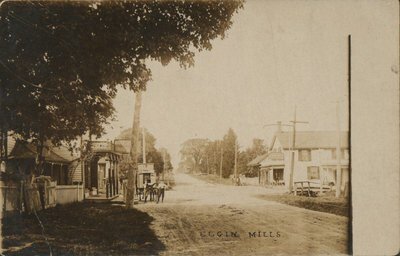 A postcard depicting Elgin Mills in Richmond Hill, Ont. On the back of the cars: message from Miss Dixon to Catherine Lynett. "Hello Kate are you still living have been looking for you every day. Well, I expect mother will be way to the Old Country by the time you get this. Cold her house today. Well, how are you any way if you cant get out write let me know when you want some help and will come out. H.B."